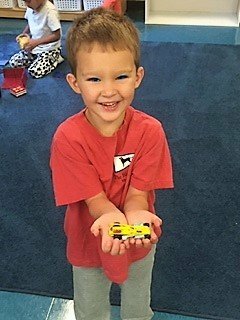 It’s been a while since Route One Fun published a Spotlight on Schools post, so I was thrilled when local parent Courtney English reached out to reinvigorate the series with a guest post about College Park Nursery School (CPNS), a co-operative nursery school in College Park, Maryland. Finding a good, quality child care, daycare and preschool in Hyattsville, College Park, Riverdale Park and the overall DC suburbs of Maryland can be a full-time job, so hopefully having the perspective of (and this opportunity to contact) a parent with a child currently enrolled in one of these local schools will lighten your load. (Thank you, Courtney!) *CPNS is hosting an open house this Tuesday, 10/16, 9:30-11:30am. Read below for Courtney’s insight on College Park Nursery School. To read more parents’ thoughts about local schools in our area, including University Park, Mount Rainier and Greenbelt Elementary, check out Route One Fun’s Spotlight on Schools page. We have been at the school now for 2.5 years and it has been such a special place for us. The curriculum is play based. There is structure and a routine/schedule in each class but children can pick an activity that interests them. I co-op in the classroom once every 3 weeks. As a co-op I have been able to see how he does in the class and watch him learn and grow from teachers and friends. It gave me a chance to meet other students in the class and have become friends with other parents. It has been such a great place for my son and myself to adapt to school life. CPNS is all about community and parent involvement and participation. Besides co-oping once every 3 weeks each family is asked to do a job for the school. From helping with a once a year fundraising event or being a board member of the school, each family is a part of the school. Whether during bi-monthly meetings, potluck get together or when co-oping all families have a chance and opportunities to meet. It is so nice to not only know the children in my sons class but also their parents. We have had experience with all the teachers at the school. Each offers a different style and perspective to kids growing and learning styles. All are loving and engaging with students. I have seen teachers help picky eaters, potty training kiddos, assist students whose primary language is not English, helping new students adjust to time away from parents and much more. All have years of experience and have such a wealth of knowledge on child education. It is so fun to see the ideas, activities and games that they implement with students. What Unique Programs Does College Park Nursery School Offer? New to us in the pre-k class is Connect 4 Learning. This is a pre-kindergarten curriculum using research-validated and classroom tested literacy, science, social emotional, and math foundations. Additionally, the pre-k class is a partnership with College Park Youth and Family Services with a weekly structured play group called “Sunshine Circles.” This won’t start in the the classroom until next month but from information received the group is designed to help children feel secure and valued, get along with others and feel part of a community through fun, playful activities. From past parent information it sounds like the group helps with social skills, learning to being a friend and including everyone in participation (i.e. how to not be a bully). What Do You Like Most About College Park Nursery School? Parent involvement. It is so lovely to be a part of the classroom twice a month. You get to see your child learning and exploring. Parent/Teacher conferences are offered but being involved with the class each month you really get to see how your child is progressing. Also, not having to be potty trained was amazing! 😊 This allowed my son to join when he was ready to start interacting with other children, regardless of whether he was potty trained at that time. They offer an aftercare program. Once class ends kids are able to stay until 3pm each day for a nominal fee ($7/hour, cheaper if you pre-pay). Being a co-op, the tuition payments are much lower compared to other pre-schools in the area.Financial aid is also offered for the school. Applications are accepted in April for review for the upcoming year. There are still spaces available in all classes for this academic school year. Email (president@cpnsk.com) to schedule a tour or attend an upcoming open houses. Read about more schools in Route One Fun’s Spotlight on Schools Series! Interested in sharing a little bit about your local Prince George’s County school? child careCollege Park Nursery SchoolDaycarePre-KSpotlight on Schools! Spotlight on Schools: Gladys Noon Spellman Elementary School!